A classic Kiwi Bach. Please note the definition: A bach (pronounced 'batch', also called a crib in the southern half of the South Island) is a small, often very modest holiday home or beach house in New Zealand. Please do not expect a gourmet chocolate on your designer bedspread. In fact, don't even expect sheets on the bed, you've got to bring your own. If you want five star motel accommodation, please look elsewhere. We regret that some guests have expectations that do not match our property, please ensure you understand this is a 'modest holiday home' and enjoy it for what it is. Our bach is nestled among the tree tops, overlooking the Tairua Harbour, Pauanui, and out to sea towards Shoe and Slipper Islands. Wake to the morning sun streaming in and the song of tui and bellbird. Listen to the call of the morepork and kiwi at night. A sense of peace and seclusion, only a 10-minute walk from the town, or a couple of minutes in the car. Comfortable but casual, sunny, fully furnished. Two bedrooms – including a mezzanine and a bunk room with a secret door. WARNING the secret doorway can be challenging to adults, halflings will be fine. Tairua is a great holiday spot. Swim in the protected harbour, or on the ocean beach. Hire a kayak and explore the harbour and estuary. Fish in the harbour, surf cast off the beach, or take a fishing charter. Check out the local bush walks – kauri groves, old mines and caves to explore (maps and information at the bach). Tairua is ideally located for day trips – close to Hot Water Beach, Cathedral Cove and Sailor’s Grave. A regular ferry service runs across the harbour to Pauanui. Try out the excellent cuisine offered at local cafes and restaurants. The town is well serviced with a supermarket, a chemist, a hardware store, cafes and restaurants, and is a Telecom hot spot – free wireless internet in the town centre. Visitors are welcome at the local golf course. For those wet days, DVDs are available locally – bring your computer to watch them – there is no TV. Families preferred, having said that the property doesn't meet current building compliance standards regarding safety for children. There is no bannister on the internal stairs, the balcony railing on the deck isn't a metre high and the mezzanine floor balustrade is not officially childproof. The photos show these ‘hazards’. However, our children have all delighted in the place! Especially the secret passageway to the bunk-room. The space wasn't clean, and the whole building shook when someone walked across a room. A very unloved and uncared for property with only the view to recommend it. This bach was completely devoid of personality inside and very run down. No TV, no ironing board, no bathmat and the second bedroom contained the laundry and in a previous life was the garage. Very expensive for what was provided. We are very sorry you didn't enjoy your time at Tairua Tree House. Our ad on the Bookabach/HomeAway website clearly states that Tairua Tree House is a 'kiwi bach', and that there is no TV, and no linen supplied. The photos accurately portray the interior. We consider the price is reasonable, and generally receive very positive feedback. 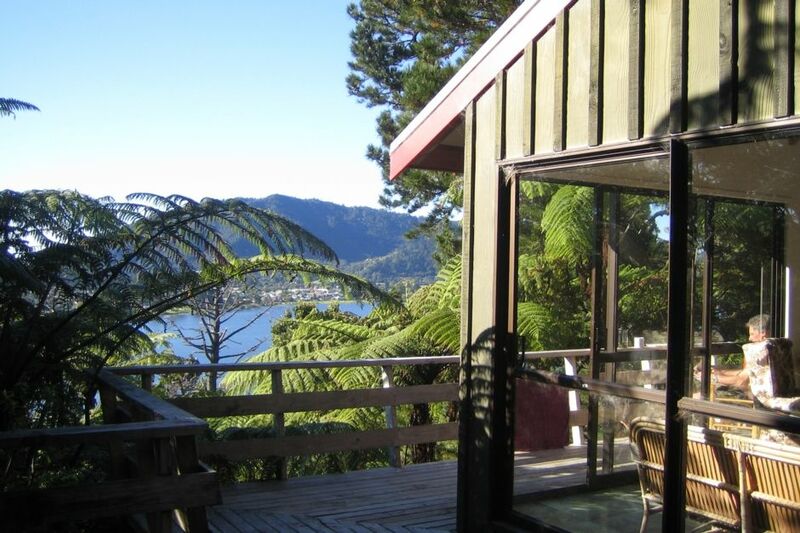 What a delightful find for us - you really are nestled in the trees with an amazing view of Tairua harbor. Gorgeous palms and flowering shrubs surround you. The view from the bedroom in the loft is an extra plus. Great sitting areas and kitchen facilities. Easy to get into town, but in a quiet, private area. We have already recommended this Bach to close friends who were impressed with it. We are delighted you enjoyed your time at Tairua Tree House. Thank you for your feedback. The views were amazing. The native birds visiting awesome. The house had everything we needed. Sad to leave.